Whether your boat comes standard with a Power-Pole or you add one yourself, it's important that you protect it. When you're not fishing, cover your Power-Pole to prevent premature deterioration from weather exposure. 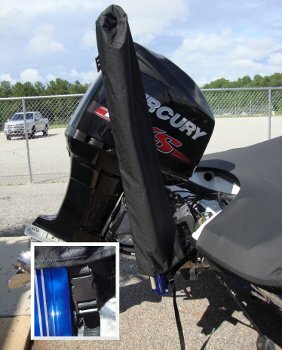 The design of this cover allows easy installation and removal, and you can even travel with the cover in place. Each cover comes with an attached strap system with a heavy-duty buckle that is designed to keep the cover securely in place. Our Power-Pole cover is an excellent solution for protecting your unit from UV damage. Cover fits units 4, 6, 8, and 10 feet deployed depths.